A new convergence of technology has survived the early stages of Gartner’s hype cycle1. It has survived the peak of inflated expectations and the trough of disillusionment. It is slowly ascending the slope of enlightenment and will soon achieve the plateau of productivity, bringing benefit to schools and their students. I am writing about the convergence of the open textbook and the interactive eBook (i.e. ePub specification 3.0). Open textbooks have been around for a while. The original inspiration, according to Richard Baraniuk, a computer science professor at Rice University, came from the open source software movement. But in the early days, the scale of the open textbook movement was understandably small. Professors in any discipline had to look long and hard for a quality textbook that could be re-purposed for their students. Today, however, the promise of open textbooks shines brighter than ever. Open textbooks are ascending the slope of enlightenment. OpenStax (http://cnx.org) alone has more than fifteen hundred books representing six broad curricular areas. Closer to home, the University of Minnesota Open Textbook Library (http://open.umn.edu/opentextbooks/) carries more than 200 open books. In a speech to the Minnesota eLearning Summit in 2013, Creative Commons’ Cable Green reported that in the last thirty years, textbooks have increased in cost by 800%. Today, to offset the high cost of college textbooks, students have multiple options: They can rent or purchase used books. They can purchase digital versions directly from companies such as Boundless Textbooks, which provides alternatives to expensive textbooks. They may be given yet another option — the open textbook. The largest disruptor in my view is the open textbook. One visit to http://cnx.org/ will tell you why. Richard Baraniuk founded Connexions at Rice University in 1999 to provide students with free educational materials. Connexions is now rebranded as OpenStax. At the conclusion of this article, you will find several resources. One of them is a TED talk delivered by Dr. Baraniuk on the subject of open source material. In a nut shell, Dr. Baraniuk likens textbook pages to learning objects or Lego™ blocks. Textbook pages can be reassembled and organized and blended with new material to serve the different needs of students. Several years ago, I scanned the list of available books. Perhaps I fell into the trough of disillusionment. Today, I am utterly astounded by the breadth and quality of materials. And all for free. At least (in the digital form) to students. This is all happening at a time when a new eBook specification has emerged. The specification is called ePub. ePub has been around since 2007 in its initial form. Until now, eBooks were available but not widely adopted. Only 28% of people, polled by Pew Research, claimed that they have read at least one eBook. That statistic is about to change. Today, the latest specification is ePub 3 and it is a game changer. ePub 3 is the convergence of text, audio, accessibility, imagery, video, MathML and interactivity in a digital book. OpenStax resources are available as ePubs, as well as PDF and HTML. ePubs play beautifully across a wide variety of eBook readers. ePub 3 books play well on iPads using either the iBooks reader or the Gitden reader. In support of this technology, LodeStar Learning has just released a beta version of ePub3Maker. The LodeStar 7 workflow that instructors use to create learning objects for learning management systems like Moodle, D2L and Blackboard can now be used to create interactive eBooks that follow the ePub 3 specification. For now, here are two simple examples of eBooks created with LodeStar. Both examples are for demonstration purposes only. 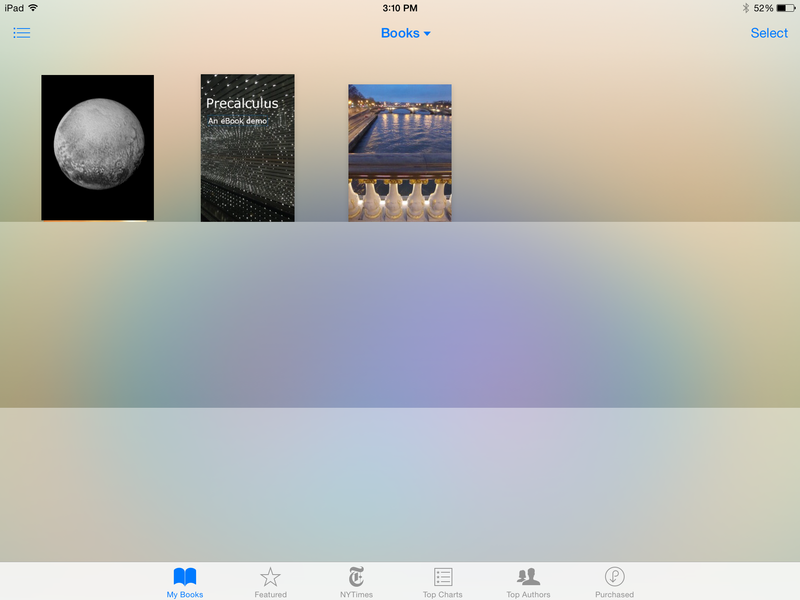 Download iBooks (or Gitden) into your iPad from the Apple Store. iBooks supports ePub 3. Then click on the links below from your iPad. The first eBook combines text, imagery, questions and video. The second is a demonstration of OpenStax content blended with interactive questions. If you are pressed for time and want to walk away from this article with something immediately useful, skip to the subtopic ‘A Remembering Design Pattern’. If you are an instructor or instructional designer who is interested in the ‘bigger picture’ related to design, then please read the entire article. I would love your input. By ‘Patterns’ (the title of this journal entry), I mean instructional design patterns. I want to make the case for instructional design patterns and solicit your input. My pitch is that sophisticated online learning developers might want to consider adding instructional design patterns to the way we think and talk about online learning design. The introduction of instructional design patterns into our conversation has the potential of broadening our thinking about online learning and the strategies that we use to engage students. This article explains the reasoning behind introducing yet another jargony word into our vocabulary, explores its benefits and provides a simple example in the form of a learning object. One would not expect that our thinking about online learning is limited in any way. The blogosphere is filled with buzz about gamification, adaptive learning systems, big data, augmented reality, mobile learning, and more. And yet, in our experience, many online instructors are grounded by the basic challenges of the learning management system tool set and their own knowledge of productivity tools like word processing, spreadsheets and presentation software. In our experience, instructors are concerned about getting their ‘content’ into the learning management system and aligning it with outcomes, assessments and discussions. The most popular authoring tool is PowerPoint. Productivity tools like Captivate, Articulate and iSpring that support the conversion of PowerPoint content into a format that is supported by the LMS are also extremely popular. Periodically, we hear from instructors whose imaginations have been lit by one tool or another – which embody some strategy. VoiceThread allows students to comment and converse asynchronously about a presentation posted by the instructor or another student. Adobe Connect enables instructors to keep online office hours and extend their classroom virtually. Adobe Captivate allows instructors to record voice-over presentations. The advent of Web 2.0, which enables us to be active creators of the web, has spawned hundreds of tools, which instructors can use. Our conversations about online and teaching have become tool-centric. Outside of the LMS tools, when an instructor finds an exciting new thing – it is usually presented as a tool rather than a strategy. Our introduction of instructional design patterns is an effort to shift the conversation from tools to strategy. The PowerPoint to HTML conversion, for example, may involve PowerPoint, some conversion tool, Audacity (for audio editing) and video captioning but the end experience is the same for students: a presentation that students passively watch. We can add in Photoshop images, a character pack, animated characters, lip synching, and other things, but we are still left with a presentation that students passively watch. Oftentimes, we do want students to watch a presentation, but we need to expand our options on how we engage students during and after a presentation. Instructional Design Patterns may help us do that. Instructional Design Patterns will help us to define student experiences first in a tool agnostic way. How would an instructor define the VoiceThread experience without using a ‘product’ name. What is that thing that is characterized by an instructor posting a presentation and then prompting students to respond with text, voice or video? FlipGrid is another tool that embodies a similar strategy. Is there a label that would help us categorize the two tools under the same general strategy? If so, then we can talk about these things not in terms of products but in terms of pedagogy. Not as consumers but as instructors. Not in terms of whiz bang technology, but in terms of outcomes and relevance to students. This, of course, is ironic coming from a tool maker. Our tool, however, has always been centered on instructional strategies. The conversation about patterns is an attempt to raise the bar in what’s possible in online learning from simple strategies to complex strategies. We’re full of ideas on new templates but frankly, instructors and designers need to recognize the pattern that each template is supporting before the templates will be extensively used. A webquest template is an example But our thinking is not limited to webquests. For each level of learning (e.g. remembering, understanding, applying, etc.) and for each type of knowledge (e.g. declarative, procedural, conceptual, problem-based) we need a list of strategies that help students with knowledge acquisition, matched to a level and type of knowledge. Instructional Design Patterns, in our application of the concept, may include one or more strategies. In our previous post, we began to define the term. A WebQuest, to use that example again, is an organized activity that follows a precise pattern. In making a WebQuest , we assign a task, describe a process to complete the task, a method to evaluate the task and a list of web-based resources that students can explore. Students collaborate with one another and conduct focused research. The task may involve writing, public speaking, and problem-solving. Clearly, a WebQuest is an activity that coordinates multiple strategies. Clearly, a WebQuest follows a pattern. Webquests have entered into the vocabulary of many K12 instructors – but, in our experience, not many post-secondary instructors. There are many good examples of Webquests in post-secondary, but when I poll post-secondary faculty, not many have heard of them. Imagine if WebQuests were part of our everyday vocabulary. A colleague or an instructor designer could suggest a WebQuest and a faculty member would instantly recognize what that meant. The activity would take time to create and time to complete. Its greatest benefit is in support of higher order thinking like analysis and synthesis. It is indeed worth the effort. But higher ed instructors need to know what it is, as well as its benefit and how to create one efficiently before they will invest the effort. Webquests support higher order thinking. We shouldn’t refer to the WebQuest design pattern by tool name. We should all recognize the term WebQuest, understand its teaching and learning implications, and, perhaps, enlist the help of an instructional technologist to list the top three tools that help instructors create WebQuests. So let’s start far down the cognitive ladder. The first rung of Bloom’s taxonomy, to use one example, is ‘remembering’ or the knowledge of facts. What instructional design pattern supports “remembering”? One candidate would be the variable interval performance queue. The variable interval queue design pattern presents students with questions that challenge students to recall facts. Medical terms, for example. Correctly answered questions get removed from the queue; missed questions get returned to the queue in variable intervals (i.e. spaced further and further apart). As we play around with the concept of “Instructional Design Pattern”, one might argue that variable interval queuing represents a strategy or a methodology rather than a pattern. That is probably true — but as we discuss engaging students in increasingly sophisticated ways we definitely move out of the realm of single strategy or methodology to a complex pattern. We need to define the attributes of a design pattern carefully. I recently viewed a graphic that showed Bloom’s taxonomy and tools matched to each level of the taxonomy. CoboCards (a Flashcard generator) was matched to ‘Remembering’, for example. Wikispaces was matched to ‘Creating’. We need a similar graphic that matches Instructional Design Patterns to the levels of learning. But what are some activities that might be candidates for Instructional Design Patterns? We need patterns that are effective in helping students achieve outcomes, support the efficient development of activities, and are memorable in that they hold a place in our vocabulary. I’ve already mentioned WebQuests and Variable Interval Performance Queue. The first has a catchy name and can easily enter our vocabulary; the second is effective, but sounds rather technical. There may be some approaches to online case studies that would merit inclusion into the design pattern classification. A far simpler instructional design pattern than the Decision Making Scenario is what I call a Present and Check. Perhaps it is too simple — but it is worth discussing. Recently, I spoke to an instructor who was excited about getting his presentations uploaded to YouTube and captioned. He had no plan for checking the students’ understanding. Present and Check improves on that. In the following example, the activity follows a simple but effective pattern. 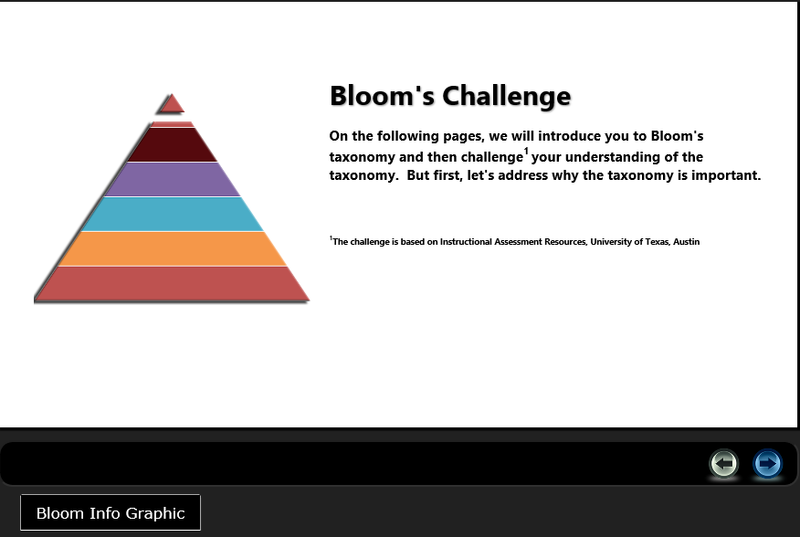 The example introduces Bloom’s Taxonomy through an embedded video from the Center for Academic Success at LSU. The activity does not end with the presentation. Students are presented with a set of instructional activities created by the University of Texas at Austen and asked to identify the correct levels of learning represented by each activity. This latter strategy is not a necessary component of Present and Check. Also optional is the look and feel, the reporting at the end, and the reference item that appears at the bottom of the screen, titled “Bloom Info Graphic”. Lastly, it is important to note that although this is a simple multiple choice self-assessment, the student is asked to do some analysis of the instructional activities and draw upon his/her knowledge from the presentation to make the right choice. This is better than simply embedding a video. We would love to hear your ideas or follow your links to other Instructional Design Patterns. It would be great to engage in discourse that is not tool-centric but centered on enhancing the ability of students to learn.